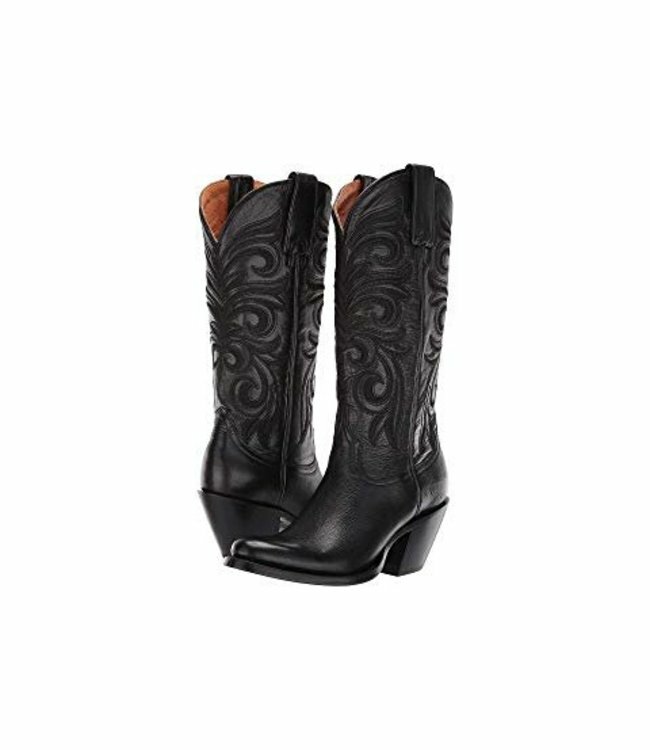 Cowboy boot made of rust leather with a timeless look, the Nicole van Lucchese.The smooth leather has subtle details in the shaft, which make this boot classic, timeless and feminine Read more.. This is a beautiful classic ladies cowboy boot made of warm brown soft calf leather. Timeless, feminine, that is the Nicole from Lucchese's collection from Texas. This western boot is handmade and will be the perfect addition to you wardrobe. On the foot this western boot has the characteristic cowboy stitch. The shaft has very subtle decorative stitches, some of which are filled with cord. On the side of the boot, there is piping and pullstraps. The sole is stitched with a single welt stitch. The sole is made of leather. No problem, place a backorder! Cognac leather cowboy boot with cognac decorative stitching ..
Black classic feminine cowboy boot for women made of calf le..